The Indiana state senate on Tuesday night passed its bill to provide Indy Eleven with $112 million worth of soccer stadium subsidies ($8 million a year for 25 years, if you’re counting at home — here’s a present value calculator to get you the rest of the way there), plus an unspecified amount of money for even more renovations to the Indiana Pacers‘ arena and Indianapolis Colts‘ stadium. So of course, the Indianapolis Star headlines are all about how the team owners will have to put in money, too! Won’t anyone think of the team owners? In Wednesday’s interview, Ozdemir declined to say whether the team was willing or could afford to pay 20 percent of the construction cost, which would be about $30 million. The bill still needs to pass the state house, but last time soccer stadium subsidies were proposed back in 2015, it was the house that approved it and the senate that rejected it, if that means anything. Also, last time Ozdemir was only asking for $82 million in stadium funding, and $112 million is a lot more than $82 million, but either stadiums have gotten a lot more expensive in the last four years or Ozdemir is seeing an opening for state funding and getting greedy — you make the call. Also also, remember that people in Indiana hate this whole sports subsidy idea, not that anyone is asking them. The Indianapolis Colts were one of the early adopters in the stadium extortion game, moving from Baltimore in the dead of night in 1984 in exchange for a sweetheart deal at the then-new Hoosier Dome, and then going back to the well just 24 years later to get Lucas Oil Stadium built with the most expensive public NFL stadium subsidies up to that time. So surely there’s no way they’d become the first sports franchise to get three new stadiums in less than a half-century, right? The team owners couldn’t actually break the lease and move until 2034, but you know that that wouldn’t stop them from trying to get a new stadium built earlier — hell, there’s already been talk of the Tampa Bay Rays moving if they don’t get a new stadium, and their lease doesn’t let them leave until 2027. So I wouldn’t count out the chances of the Colts at least shooting for a three-peat before the 50th anniversary of Moving Van Night. The whole Indianapolis Star article that the above quotes are from is worth reading, as there are some other interesting nuggets as well, including Indianapolis deputy mayor for development Jeff Bennett remarking of the lack of development springing up around the ten-year-old football stadium that’s open for ten whole days a year: “I look out my window at work every day and see the stadium and the neighborhood around it. It’s just a matter of time now. The interest is there. It’s not a question of ‘if’ anymore, it’s ‘when. '” Hopefully before 2034! In a forthcoming paper, [Berry College economist Frank] Stephenson examines the 2012 Indianapolis Super Bowl, which generated 224,000 hotel stays, according to its economic impact report. Indianapolis serves as an apt comparison to Minneapolis since it is a cold-weather city in the Midwest. Actually, in the week leading up to the Super Bowl and the three days afterward, Indianapolis hotels rented an additional 49,000 rooms compared with what would be expected, less than a quarter of the estimate. That is a large discrepancy! 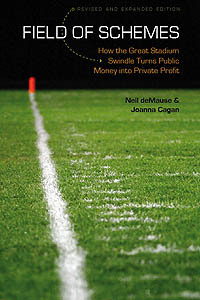 We’ll have to wait for Berry’s full paper to get into the nitty-gritty of where all those Super Bowl visitors are staying, but it certainly helps explain why other economists like Holy Cross’s Victor Matheson have found the economic impact of the game to be less than a quarter what the NFL and host cities claim. Meanwhile, the city of Minneapolis is spending $50 million on hosting the game (on top of the billion dollars or so it put into the Vikings‘ new stadium that’s hosting it), though it says it’s raised it from corporate donors. I think I’ll wait to see what the actual numbers look like after the fact, though — it’s becoming increasingly clear that when it comes to the Super Bowl, you want to check the final bill, not the initial estimates. They finally got it closed a few minutes ago (11:40 am, according to the Indianapolis Star), but you just know this is going to lead to the Colts demanding a new stadium, since it’s been nine whole years since the team built this one with $715 million in public money. I’m joking, I think, but given that this is Indianapolis, maybe not. Indiana to give Goldman Sachs $71m in Colts bond refinancing, that sure sounds bad, don’t it? The Indiana Finance Authority, which borrowed for the home stadium of the Indianapolis Colts National Football League team, is paying about $71 million to Goldman Sachs Group Inc. to end an interest-rate swap as part of a bond sale to refinance debt. That sounds bad — and it is bad, because it means Indiana made a lousy bet when it agreed to an interest-rate swap in financing the Colts stadium in the first place. But is this really an extra $71 million coming out of the pockets of Indiana taxpayers? The new fixed-rate bonds are at an awfully low rate, so you’d need to weigh that $71 million lump-sum cost against the savings from not having to pay higher interest rates in the future, and then compare it to the projected bond costs when the deal was first agreed to, and … no matter how far I scroll down in this Bloomberg article, it’s not going to tell me any of this, is it? Sigh. Suffice to say that this could be a good thing, or a bad thing, or making the best of a bad thing that was done years back — the only sure thing is that Goldman Sachs is getting paid, which is always the only sure thing. You probably didn’t even know that Gary, Indiana spent $50 million in 2002 to build a sports stadium for an independent-league baseball team, theGary South Shore RailCats— I didn’t know, so I’d be stunned if you did. But now that you do, I bet you’re wondering, “Wait, are people really flocking to downtown Gary, Indiana just because there’s a minor-league baseball team in town? And it’s hard not to notice the largest projects counted by the mayor as successes have all been heavily, and in some cases completely, subsidized by government. Stand-alone private investment is almost nil. The unemployment rates in Indiana and Indianapolis are lower than the national average, and both the state and city have sizable budget surpluses. The essay, which features zero quotes from anyone actually in Indianapolis, is already getting shredded by Atlantic Cities commenters, who have noted errors both small — the Colts moved to Indianapolis in 1984, not “the 1970s,” and the city hosted the Super Bowl in 2012, not 2006 — and large — that “sizable” city budget surplus is actually a $55 million deficit, and comes on the heels of years of painful budget cuts to close past budget gaps. Which weren’t entirely created by the hundreds of millions of dollars spent on new buildings for the Colts and Pacers, or by the tens of millions more that the city gave to the Pacers to keep playing in their brand-new arena, but it sure didn’t help. To be fair, by the end of the article Masciotra does credit Indianapolis’s alleged renaissance — which, as one flabbergasted Indiana correspondent wrote to me, is sourced partly to an L.A. Times article from “19-friggen-86” — to not putting all its eggs in the basket of sports, but rather to “cross-sector partnership” that helped spur new shops and “the second largest collection of urban monuments in the country.” (And also to lowering property and business taxes and privatizing services, which also haven’t actually worked out all that swimmingly.) But that just raises the question: If you still have to build public fountains and give tax breaks to downtown businesses in order to create development, can you really claim that it was sports that provided your magic beans? Which is totally to the benefit of the city and not just the Colts, because, um. But the Colts are paying $700,000 for some new ad boards for themselves at the same time, so it’s a public-private partnership, right? In the grand scheme of things, $2 million on top of the $715 million that the CIB already spent to build Lucas Oil Stadium isn’t really all that much. Still, coming on top of the $33 million in operating subsidies the CIB threw at the Pacers three years ago, Indianapolis just solidified its lead as national champion at throwing good sports dollars after bad. On the “best to worst subsidies” graph (most of which consists of a graphic that looks to have been lifted from one of these), it says that “Public financing accounted for 50 percent of the new Lucas Oil Stadium [in Indianapolis], offset by taxes on hotels, rental cars, restaurants, and sales of Colts license plates.” Um, no. The “Making It Work” chart, once you’ve scrolled over little gratuitous circles to see what the chart actually says, suggests “folding in concessions and entertainment” uses for a sports facility, pointing to the “apartments and office space” of Brooklyn’s Barclays Center as an example. Exempt that none of the apartments have broken ground yet, and the office tower was scrapped four years ago. On the marginally less stupid front, meanwhile, let’s turn to Bill Parker of DRays Bay, who has penned an essay about the Tampa Bay Rays‘ stadium campaign that, like Pacific Standard’s infographic, starts by acknowledging that stadium deals are almost always terrible for the public before asking, gee, can we get one of them here? I think that on some level, by now, virtually every governor, city council and county board of commissioners recognizes that it’s a bad deal. Yet, they continue to happen because there’s the fear that the team will bolt to another location, and no politician wants to be the one who was stuck in office when the team left town (which is a bad thing for real-world reasons, too; the teams do provide jobs, even if it’s a low number for their revenue brackets, and tend to have pretty active local charity arms). It’s in everyone’s collective interest to simply agree to stop doing these deals, but individual actors (cities, in this case) often have their own reasons to ignore the common good and do it anyway. And so this keeps happening. But can it happen in Tampa or St. Pete?